I love xkcd. It's one of my favorite webcomics and is daily reading for me. It's very geeky, mainly for tech and math geeks, but it's brilliant. Simple style with big ideas. The latest comic created by Randall Munroe on xkcd.org features a series of Movie Narrative Charts that map out characters throughout an entire trilogy (specifically Lord of the Rings and Star Wars). It maps their relation (are they near or far from each other) over the horizontal axis of time. Take a look, it's pretty damn cool, you'll understand once you see it. And to top it all off, he threw in charts for 12 Angry Men and Primer as well, for a laugh. You've just got to see this! At first I tried to follow this and make some sense of it, but eventually I realized it gets very confusing very quickly. I guess I'm trying to process every moment in every movie and remember everything. Oh yea, I guess Treebeard didn't really do anything after The Two Towers, he just hung out and still exists. 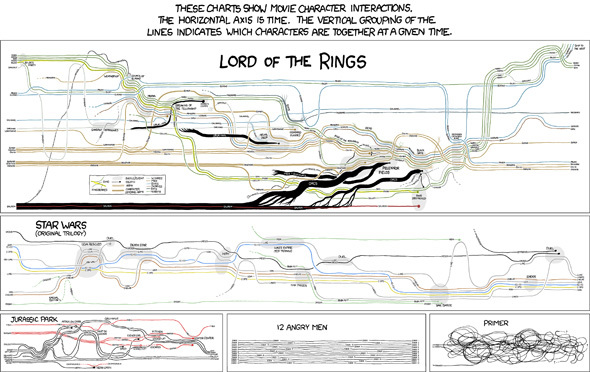 Hell, I'd pay good money to see an entire book of these kinds of charts for every major movie. They're fascinating to look at. I wonder if screenwriters chart out their movie like this while they're writing it - seems like it'd be helpful in keeping the story together (look at Jurassic Park, every last raptor is accounted for). Brilliant! xkcd is the best. following the comic for awhile. I was expecting some pretty epic mouse-over text for this, but he kinda let me down. Especially since this comic included his oft documented major fear: Raptors with door opening abilities. Usually the mouse-over text is the best part of his comics. That said, Randall is the man. I love when he does crazy awesome stuff like this. wow! thats crazy! but for primer, is it a joke? or was he like "**** it"
The timeline for Primer is just brilliant. I think Tufte would approve. Randall Munroe is indeed brilliant, although it is probably wise to partake in his subversive comic strip at home rather than at work. I check out XKCD first thing in the morning on Mondays, Wednesdays and Fridays. The strip on Monday 3 November 2009, must have taken a lot of time to draw. Most certainly Edward Tufte, the author of "Visual Display of Quantitative Information" , would approve. Travis, a similar plot for "Lost" would be interesting, but it would have to be drawn on multiple pages. For a real challenge, consider what a plot for "Groundhog Day" would look like. He must have watched those movies a bunch of times in order to make these - and all for a joke about how primer didn't make any sense. Neat charts, tho. He should do one for The Matrix... you'd have to branch the lines in order to show both the interactions in the Matrix and the interactions in the 'real world'. I wanna see one for Doctor Who!